OSWEGO, NY (November 20, 2017) – After a successful debut this past September, the Lighthouse Lanes Small Block Supermodified Touring Series will return to action in Central New York for 2018 under continued leadership from series president and founder Mike Bruce along with promoter and media director Camden Proud. Founded in March 2017 and derived from the idea to bring back the feel of the now defunct Northeast Organized Racer’s Association to Oswego Speedway’s Small Block Supermodified class, the tour made a successful debut with its first annual ‘Fall Brawl 50’ event at the Evans Mills Speedway this past September. Over 20 race cars showed up for the series’ inaugural event which was won by Oswego Speedway’s 2017 Pathfinder Bank SBS champ Dave Cliff. After an impressive start, the series is set to return in 2018 with continued support from Lighthouse Lanes in Oswego. Bruce has been busy over the past several weeks communicating with track owners regarding the 2018 schedule, while Proud has created a new website for the tour, LighthouseLanesSBSSeries.com. Roughly five events are planned for the series in 2018, including two pre-Oswego races to tentatively be held at Evans Mills at the beginning of May. With Evans Mills making the notable switch to Friday night racing last month, this will also mark the first time the Lighthouse Lanes SBS Series has run under the lights. Also being explored as part of the schedule are a mid-June event at the Spencer Speedway in Williamson along with an additional September show at the Adirondack Speedway located in Castorland, N.Y. Frequent updates regarding series meetings, fundraising, purse and tow money, and of course the finalization of the 2018 schedule will all be made available at the new series website; LighthouseLanesSBSSeries.com. 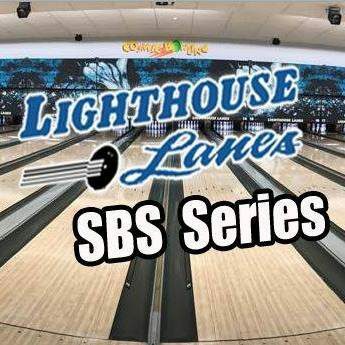 Series headlining sponsor Lighthouse Lanes was constructed in 2003 to provide Oswego, NY with a new home for bowling and entertainment. The project was spearheaded by Bob Hoefer and Nick Sereno and after some searching, the pair found the perfect home for their new plan on Jim Shampine Drive adjacent to the Oswego Speedway. With the help of experienced manager Dana Hollister, Lighthouse Lanes has become one of the premier bowling locations in the Central New York area hosting functions such as cosmic bowling, leagues, birthday and holiday parties, plus Chicken BBQ fundraisers for a wide variety of organizations including the Lighthouse Lanes SBS Series. Also part of Lighthouse Lanes is the Hall of Fame Lounge and bar, a full-sized game room, meeting areas, and the bowling alley’s concession stand and restaurant which features it’s popular homemade chicken wings and sheet pizzas. At least one fundraiser is planned for the series this offseason once again to be held at Lighthouse Lanes, with further details and information to be announced in the coming weeks on series social media. Several drivers have already expressed interest in the 2018 Lighthouse Lanes SBS Series Tour including Bruce, Cliff, Tim and Chris Proud, Haynes / Pratt Racing, Jack Patrick, Missile Motorsports, Cameron Rowe, Rob Pullen, Barry Kingsley, Vern LaFave, Josh Sokolic, and many more. Those intending to receive updates from the Lighthouse Lanes SBS Series updates may visit online at LighthouseLanesSBSSeries.com. You can also LIKE on Facebook at Facebook.com/LighthouseLanesSBS or FOLLOW on Twitter @LHLSBSupers. About the Lighthouse Lanes SBS Series: The Lighthouse Lanes SBS Series, the country’s only Small Block Supermodified touring series, was formed in March 2017 by drivers Mike Bruce and Camden Proud in association with the Evans Mills and Spencer Speedways. A five race venture in 2018, the series is made possible from the support of Lighthouse Lanes, Route 37 Building Supply, Cam’s NY Pizzeria, as well as the dedicated team owners, drivers, and fans of Small Block Supermodified racing.